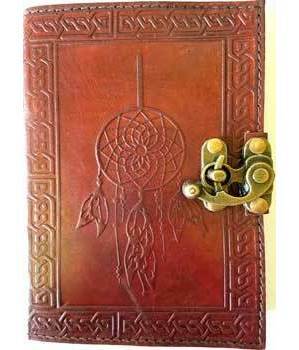 This Dreamcatcher leather blank book, is centered with a tooled embossed dream catcher, bordered with a tooled designing. The back cover has beautiful embossed tooling around the border edge, and is centered with an embossed Celtic knot design, it's spine edge has attractive leather cross stitching, secured by a metal brass colored latch. 5" x 7" - 240 pages - Unlined. Pages of Handmade Linen Parchment Paper!